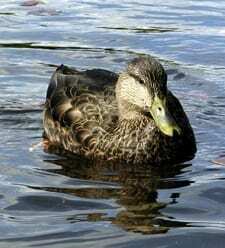 The American Black Duck hides in plain sight in shallow wetlands of eastern North America. They often flock with the ubiquitous Mallard, where they look quite similar to female Mallards. But take a second look through a group of brown ducks to notice the dark chocolate-brown flanks, pale grayish face, and olive-yellow bill of an American Black Duck. Numbers of this shy but common duck declined sharply in the mid-twentieth century. Hunting restrictions have helped to stabilize their numbers, although habitat loss remains a problem.